Protesters, wearing masks of May and US President Donald Trump, were chanting “Stand up for Gaza” and “Stop the Killing,” in front of Israel’s embassy on Friday. Hundreds of people have gathered in front of Israel’s embassy in London to protest 70 years of the occupation of Palestinian territories by the Israeli regime, calling on the government of Prime Minister Theresa May to stand up for the Palestinians. Protesters were met by a small group of people carrying Israeli flags near the embassy in South Kensington High Street. 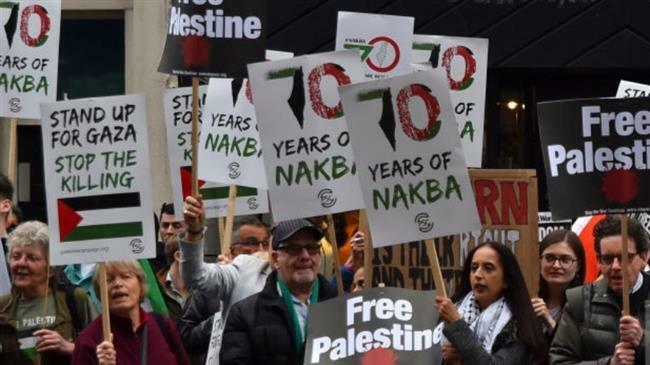 The rally was held ahead of the 70th anniversary of the Nakba Day (Day of the Catastrophe), which is officially marked every year on May 15, one day after the Israeli regime came into existence in 1948 and caused the displacement of some 750,000 Palestinians. More than 7 million Palestinian refugees are currently living in exile, the countries; Jordan, Lebanon, Syria with many others being settled in refugee camps in the occupied West Bank and Gaza Strip. This entry was posted in News and politics and tagged Anti-Israel Protesters, Stand up for Gaza, Stop the killing. Bookmark the permalink.